This is the official website of Apperley Cricket Club. We are a small club in the village of Apperley near Tewkesbury in northern Gloucestershire. This site presents the club, its history and other general information. For fixtures, match stats and other data please visit our page on Play Cricket. For latest information about joining the Club and practice times please contact the First XI captain. Visitors and social members are always most welcome to come along - we have a well stocked bar and the ground sits in a lovely rural setting. As well as match days we open up on most Friday evenings during the season, with food and drink available in a convivial family friendly atmosphere. The club has a history of supporting a wide range of charities, both local and also some further afield with particular connections to the club and its members. APPERLEY QUARTER MARATHON - SEPTEMBER date TBC- 11.00 start. The annual Quarter Marathon (approx 10km) starts and ends at the Cricket Club. Refreshments etc available for participants and spectators. Everyone welcome!! For entry forms please contact Lis Wilkes on 01452 780654. 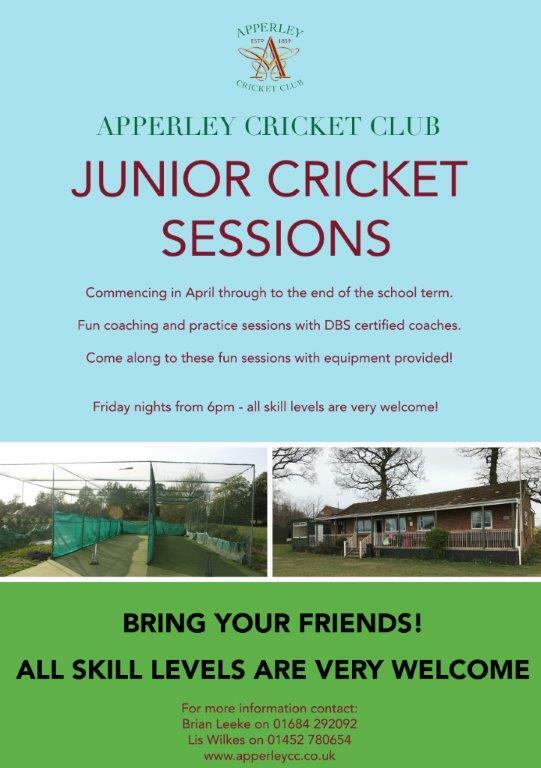 Apperley CC has a number of youth teams playing in the local district league and girls County League. Age groups: Under 9, Under 11 (mixed boys & girls and an individual girls team) and Under 13. Winter indoor coaching is available from January to March and outside coaching and training on Friday evenings from April to August. League & Cup matches are played usually on Sunday mornings U9's & U13's, & Tuesday evenings U11's. In late August there is a three day Summer Camp for the youth teams. More information is available from Brian Leeke (01684 292092) and Lis Wilkes (01452 780 654). Newcomers will be most welcome.